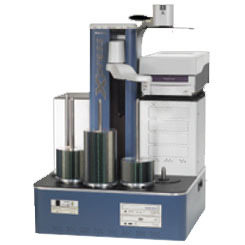 Print Production With no CD or DVD writers, Microtech's Xpress Autoprinter is made exclusively for automated disc printing. Print many unique or identical text and graphical images directly onto your CDs and DVDs. Add Microtech's proprietary ImageAligner2, the Xpress Autoprinter can add text or graphics to discs that have been already silk-screened. Superimpose text or graphics onto an existing design with amazing accuracy. Microtech has been creating software for over 25 years and it is no wonder that our complete suite of disc publishing and duplication software, ImageMaker EZ, MyDisc, and CD-Remote offers the quality, capability, and proven engineering that keeps even our most demanding clients coming back year after year. Teac P-55 thermal printer uses the latest retransfer technology for superior photo quality and full disc coverage. The results are comparable to off-set printing. Rimage Prism thermal printer is ideal for printing text or graphics on blank or pre-silk screened discs in either black or single color. XpressJet II inkjet printer, developed in partnership with Hewlett Packard provides professional print quality (4800 dpi). The Xpress AutpoPrinter is compatible with most media including Cardshaped CD and DVDs.